Commercial and architectural construction markets have relied on the flexibility and versatility of Unistrut Ceiling Grids for years. 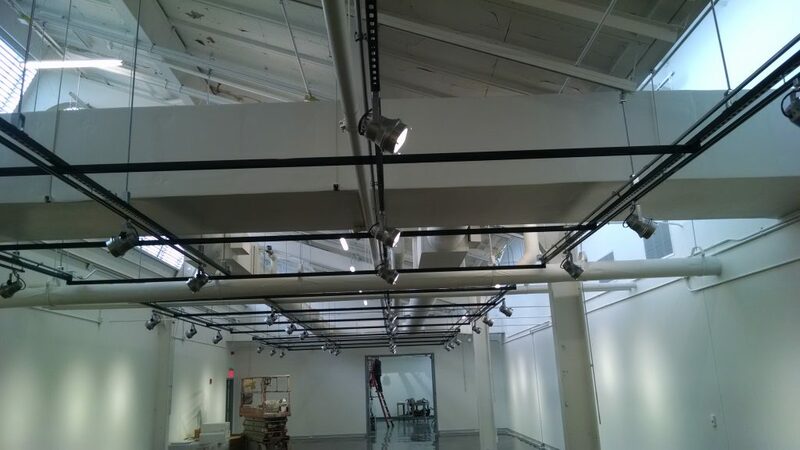 Typically supported by threaded rod, ceiling grids are ideal for supporting miscellaneous MEP and decorative panels, as well as offering infinite adjustment of lighting in galleries, shops, restaurants and more. 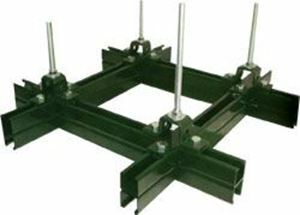 The versatility of Unistrut ceiling grids allows attachments to be made anywhere along the channel opening without time consuming fastening methods such as welding or drilling. The ease of installation and abundance of available fittings means significant savings in time and labor cost. Thanks to the infinitely adjustable nature of structures built with the Unistrut System, your new ceiling grid can easily adapt to changing needs. In addition to providing structural support for electrical and mechanical systems, Unistrut ceiling grids can also serve as a decorative, design element, creating stunning ceiling site lines with a high-tech look and feel. Unistrut ceiling grids are designed specifically to the customer’s requirements and can be designed to accommodate existing obstructions or site conditions. If desired, additional services such as specially painted grids, seismic bracing, structural calculations or engineering seals can be provided. Whether your application requires Unistrut ceiling grid materials for a do-it-yourself installation, or you are looking for expert design, engineering assistance, and installation, Unistrut Service Company is here to help. Ready to learn more about Unistrut ceiling grids, or to get a quote? Contact us today! 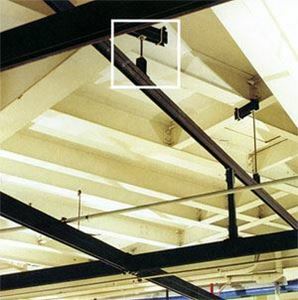 Drops for this ceiling support grid are fabricated from threaded rod suspended from Unistrut framing channel, which is attached to the roof structure with Unistrut beam clamps. This grid was a 4' x 4' grid that attached to the building concrete deck with Hilti KB-TZ anchors, and was constructed our of P1000t, P1028, P1031, P1036. Since the grid was exposed, the owner had requested a custom powdercoated color. 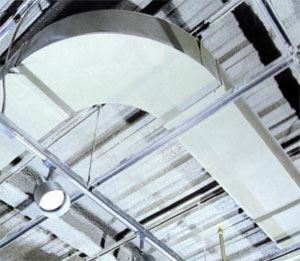 This Unistrut ceiling grid effectively supports a variety of overhead services, including both lighting and air-handling ductwork. 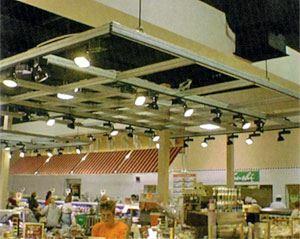 Unistrut ceiling grid for retail application.